The individuals listed below have volunteered to represent an area of New Chauncey to help welcome new neighbors, serve as a local contact, and to help disseminate information. The purpose is to help the entire New Chauncey Neighborhood feel more connected. 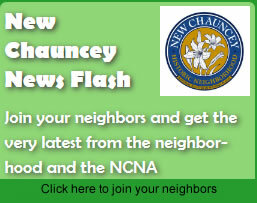 If you would like to represent your street, corner or section of New Chauncey please contact one of the NCNA leadership team or use the web site and place “Street Rep” in the subject.